WEST LAFAYETTE, Ind. - Researchers have discovered a new reaction mechanism that could be used to improve catalyst designs for pollution control systems to further reduce emissions of smog-causing nitrogen oxides in diesel exhaust. "The key challenge in reducing emissions is that they can occur over a very broad range of operating conditions, and especially exhaust temperatures," said Rajamani Gounder, the Larry and Virginia Faith Assistant Professor of Chemical Engineering in Purdue University's Davidson School of Chemical Engineering. "Perhaps the biggest challenge is related to reducing NOx at low exhaust temperatures, for example during cold start or in congested urban driving." However, in addition to these "transient" conditions, future vehicles will naturally operate at lower temperatures all the time because they will be more efficient. "So we're going to need catalysts that perform better not only during transient conditions, but also during sustained lower exhaust temperatures," Gounder said. He co-led a team of researchers who have uncovered an essential property of the catalyst for it to be able to convert nitrogen oxides. Findings will be published online in the journal Science on Thursday (Aug. 17) and will appear in a later print issue of the magazine. "The results here point to a previously unrecognized catalytic mechanism and also point to new directions for discovering better catalysts," said William Schneider, the H. Clifford and Evelyn A. Brosey Professor of Engineering at the University of Notre Dame. "This is a reaction of major environmental importance used to clean up exhaust." The work was performed by researchers at Purdue, Notre Dame and Cummins Inc., a manufacturer of diesel engines. "Cummins has been supporting Purdue chemical engineering research related to the abatement of engine emissions for the past 14 years," said Aleksey Yezerets, director of Catalyst Technology at Cummins. "This publication shows one example of the many insights into these complex processes that we have worked on together through the years." Zeolites have a crystalline structure containing tiny pores about 1 nanometer in diameter that are filled with copper-atom "active sites" where the chemistry takes place. In the new findings, the researchers discovered that ammonia introduced into the exhaust "solvates" these copper ions so that they can migrate within the pores, find one another, and perform a catalytic step not otherwise possible. These copper-ammonia complexes speed up a critical bond-breaking reaction of oxygen molecules, which currently requires an exhaust temperature of about 200 degrees Celsius to occur effectively. Researchers are trying to reduce this temperature to about 150 degrees Celsius. "The reason this whole chemistry works is because isolated single copper sites come together, and work in tandem to carry out a difficult step in the reaction mechanism," Gounder said. "It's a dynamic process involving single copper sites that meet to form pairs during the reaction to activate oxygen molecules, and then go back to being isolated sites after the reaction is complete." This rate-limiting step might be accelerated by fine-tuning the spatial distribution of the copper ions, leading to lower nitrogen oxide emissions at cooler temperatures than now possible. To make these discoveries, the researchers needed techniques that could "see" the copper atoms while the catalytic reaction was happening. No one technique is able to accomplish this, so they combined information from studies using high-energy X-rays at a synchrotron at Argonne National Laboratory, with molecular-level computational models performed on supercomputers at the Notre Dame Center for Research Computing and the Environmental Molecular Sciences Laboratory at Pacific Northwest National Laboratory. "Beyond a doubt, we could not have made these discoveries without a diverse and tightly integrated team and access to some of the most powerful laboratory and computer tools in the country," said Schneider. Although the project focuses on "on-road" pollution abatement applications, the largest market share for zeolite catalysts is in petroleum refineries. The discovery has implications for "heterogeneous catalysis," which is widely used in industry. "Most catalytic processes in industry use heterogeneous technology," Gounder said. The paper was authored by Purdue graduate students Ishant Khurana, Atish A. Parekh, Arthur J. Shih, John R. Di Iorio and Jonatan D. Albarracin-Caballero; University of Notre Dame graduate students Christopher Paolucci, Sichi Li and Hui Li; Yezerets; Purdue professor of chemical engineering Jeffrey T. Miller; W. Nicholas Delgass, Purdue's Maxine Spencer Nichols Professor Emeritus of Chemical Engineering; Fabio H. Ribeiro, Purdue's R. Norris and Eleanor Shreve Professor of Chemical Engineering; Schneider; and Gounder. The research has been funded by the National Science Foundation and by Cummins Inc.
"This research is part of our mission as a land-grant university," Gounder said. "We work with companies in the state of Indiana, and this work was an essential part in the education of many students." Note to Journalists: A copy of the research paper is available by contacting Science at 202-326-6440, scipak@aaas.org, or from Emil Venere at Purdue University, 765-494-4709, venere@purdue.edu. A YouTube video is available at https://youtu.be/aUKoT6TkVWg. Other multimedia materials are available on Google Drive at https://goo.gl/FPyKYD. The materials were prepared by Erin Easterling, digital producer for the Purdue College of Engineering, 765-496-3388, easterling@purdue.edu. 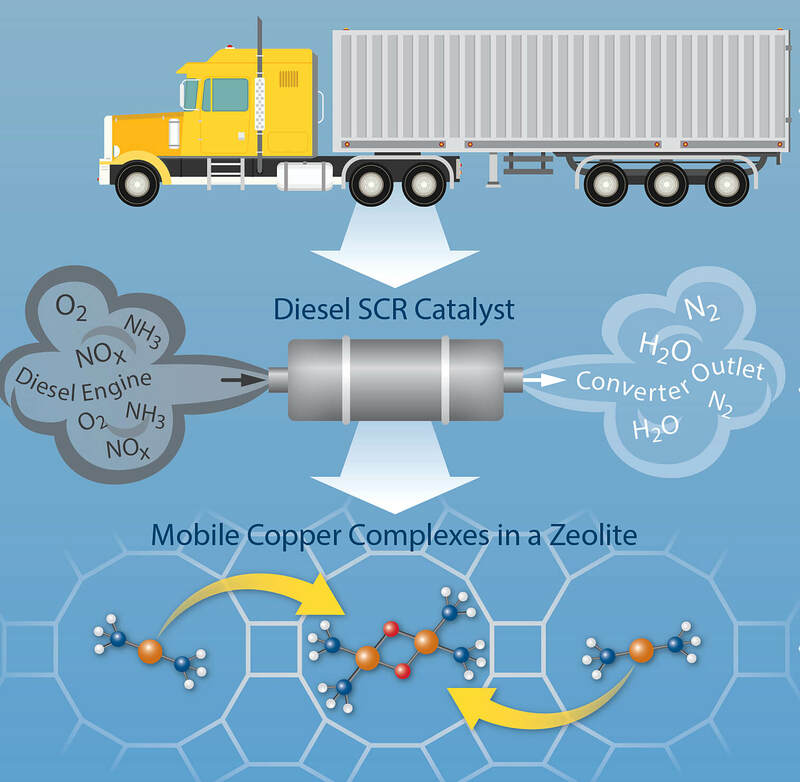 Copper ions exchanged into zeolites are active for the selective catalytic reduction (SCR) of NOx with NH3, but the low temperature rate dependence on Cu volumetric density is inconsistent with reaction at single sites. We combine steady-state and transient kinetic measurements, x-ray absorption spectroscopy, and first-principles calculations to demonstrate that under reaction conditions, mobilized Cu ions can travel through zeolite windows and form transient ion pairs that participate in an O2-mediated CuI ? CuII redox step integral to SCR. Electrostatic tethering to framework Al centers limits the volume that each ion can explore and thus its capacity to form an ion pair. The dynamic, reversible formation of multinuclear sites from mobilized single atoms represents a distinct phenomenon that falls outside the conventional boundaries of a heterogeneous or homogeneous catalyst. National Science Foundation, Cummins Inc.